The Gladney Rose Garden is located in front of the Linnean House in the east section of the Garden. The Rose Garden is well known for its fragrant roses, beautiful arbors and the old-fashioned white fence that surrounds it. A back up site in case of inclement weather is not available at the Gladney Rose Garden. A wedding assistant from Catering St. Louis will be present at your rehearsal and wedding ceremony. There is an additional chair set up fee for a seated ceremony. Price includes capacity chairs. Removal of chairs may be subject to an additional fee. 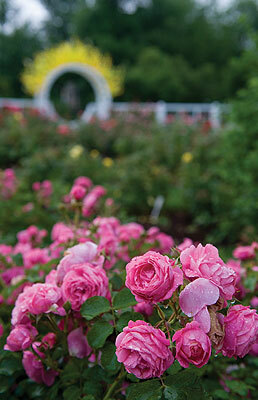 The Gladney Rose Garden is available only at 5:30 p.m.